I’m adamant about washing my face twice a day. Unfortunately, I’m not as good about washing my makeup brushes. That is until I figured out how to clean makeup brushes with an easy DIY cleaning solution. My mixture requires two ingredients I already have in my home — and it’s completely nontoxic, unlike other brush cleansers you can buy. Cleaning your makeup brushes is a crucial step in any healthy beauty routine. Without regular cleaning, brushes can develop dangerous pathogens and fungus, which can lead to issues from pink eye to staph infection. Not to mention, your tools won’t work as well when they have product buildup on them. You can avoid these problems by using the recipe below to clean your brushes at least once a week. *I like to use the Dr. Bronner’s Tea Tree because it has extra antimicrobial properties. The unscented formulation works well, too. You should avoid Dr. Bronner’s Peppermint because it could sting your eyes if used on an eye-makeup brush. Step 1: Mix together 4 parts Dr. Bronner’s and 3 parts Olive Oil in a small water glass. I like to use a teaspoon as my measurement. Step 2: Place your brush under running warm water. Be sure you don’t submerge the area where the brush goes into the tube, since that could dilute the bristle glue. Use your fingers to loosen some of the makeup under the water. Step 3: Place your brush in the glass, coating it with the cleaning mixture. Step 4: Rub the brush in the palm of your hand, loosening the makeup. Do for about 30 seconds. Step 5: Run the brush under warm water again, using your fingers to remove the excess cleaning mixture and makeup. Step 6: Wipe the brush on a clean dishtowel and let it air dry completely before using. 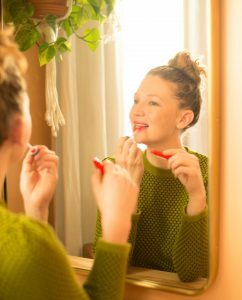 Repeat steps 3, 4, and 5 if you have a lot of makeup buildup. This solution gets my brushes cleaner than anything I’ve tried before. It also makes the bristles shine, thanks to the conditioning effects of the olive oil. In the past, I’ve used special brush cleaning solutions or my shampoo to clean my makeup brushes. Both of those worked, but took a while to really get the grime out. With this DIY solution, each brush gets clean in a matter of seconds. That’s important: because the less time it takes to clean my brushes, the more likely I am to do it on a regular basis.